If you are seeing small differences it is probably because you are using a version of Excel 365 that is targeted at home users (rather than business). Excel 365 versions targeted at business users are updated twice a year with a new semi-annual version. Excel 365 versions targeted at home users are updated more frequently (usually once every month). For this reason users of the Excel 365 home versions will always be slightly ahead of the current semi-annual version used by business users. We publish an updated edition of the book twice a year (in January and July) to coincide with each new semi-annual release. I'm using an older or Mac version of Excel. Is there a free Basic Skills book for earlier versions? Yes. We publish a FREE Excel Basic skills e-book for all Excel versions in common use (including Apple Mac versions). You can download our other free Basic Skills e-books here: Excel 2007, Excel 2010, Excel 2013, Excel 2019, Excel 2016 for Apple Mac and Excel 2019 for Apple Mac. This book was written using the Excel 365 January 2019 semi-annual version 1808. The next edition of this book will support the July 2019 semi-annual update. The free Basic Skills Excel tutorial will get you started with Excel fundamentals. Even though it is a basic skills course you’ll still master many skills that professional Excel users are unable to use. Available entirely free as an e-book. If you need Excel skills to get a job you may prefer to begin with our Essential Skills course (it includes all of the Basic Skills material and will take you to a higher level of proficiency, giving you all of the skills that an employer would expect). 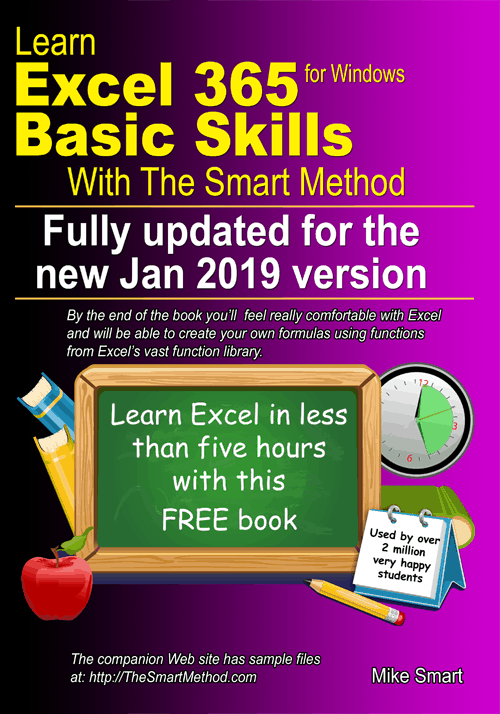 Free Basic Skills books are also available for Excel 2007, Excel 2010, Excel 2013, Excel 2016, Excel 2019, Excel 2016 for Apple Mac and Excel 2019 for Apple Mac.